Rev. Brian Patrick Woodrow (Diocese of Trenton Liaison to the Extraordinary Form) meets with Mother Cecilia, osb, Prioress. For the Benedictines, the Mass is the center of their spirituality and the mystical focal point of the day. They daily partake of the Extraordinary Form of the Mass (1962) in accord with Pope Benedict’s Summorum Pontificum, the liturgy which the Church has jealously guarded for centuries. Bound up inextricably within this ancient liturgy, is a great reverence for the sacredness of the holy priesthood, which is at the heart of their charism. The fitting worship rendered to Almighty God in the Holy Sacrifice spills over into the chanting of the Divine Office. The Benedictine stands in a particular way as a figure of the Church, the Bride of Christ. She can do so no more fully than when she daily chants the Divine Office, the official prayer of the Church. And so they gather for the principal “work of God” as St. Benedict calls it, eight times a day. The entire 150 psalms with their hymns are chanted throughout the week as originally prescribed by the Rule. For this end also, the sisters use the 1962 Monastic Office, with its traditional Gregorian Chant, in Latin, the official language of the Church, and continue the rich legacy of their predecessors. Since the monastery is the “vestibule of heaven,” they anticipate the life of praise to come through the Divine Office. The verses of the psalms are sung antiphonally, (back and forth from one side of the oratory to the other) to imitate the choirs of angels in heaven, in their incessant praise. We “sing our lives and live our song,” as Mere Genevieve Gallois wrote, so the Divine Office, in turn, spills over into a spirit of recollected prayer throughout the day, nourished also by silence, solitude and Lectio Divina. The Sisters hard at work sewing liturgical vestments. 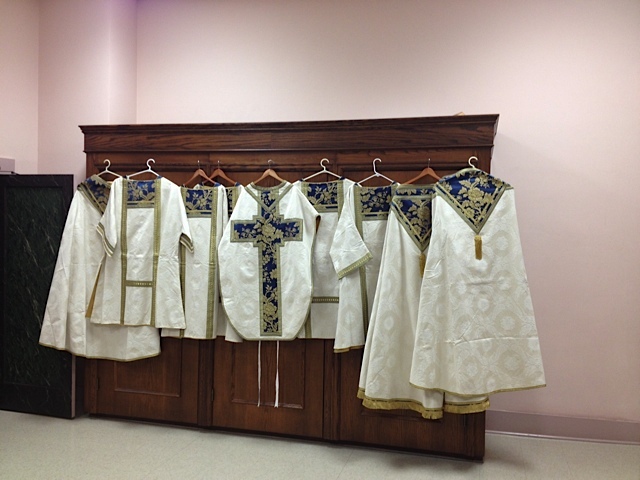 In their prayerful support for priests, the sisters desire to assist them in a very tangible way by the hand-crafting of vestments, priestly apparel, sacred linens and altar cloths. The Benedictines use the finest materials available, primarily pure silks and Belgian Linen, in order to give the best of God’s creation back to Him, and for the restoration of beauty to the altars where He dwells among us. Carried out in the Benedictine spirit of silence, each stitch is a prayer for the sanctification of the priest who will be using their vestments. Due to the contemplative nature of their life, the sisters devote approximately five hours of the day to work. During that time they attend to all matters of ordinary farm and household maintenance in addition to their sewing. "Each year during this season, we strive to unite ourselves to Our Lady in her joyful longing, her quiet and prayerful expectation of the Child Jesus’ birth. We hope this Advent recording will help many souls to enter into the mysteries of this holy season with Our Lady’s heart." Click here to pre-order the Advent At Ephesus CD! Please visit the sisters' website at benedictinesofmary.org.